After a failed attempt Monday night at finding a decent IPA (seriously, the only one we found in this town was from Sleemans,) we made an journey to our favorite beverage shop. Lena's in Painesville is only 31 miles away, after all. Sitting proudly in the third cooler sat Stoudts Double India Pale Ale. 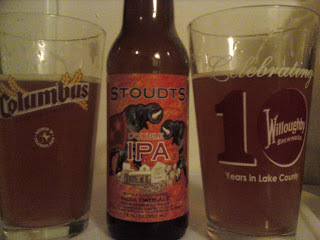 Having great memories of the only Stoudt we have every tried, we picked up a 6-pack. Helping us with the pivotal third opine today is Mr. Johnny V.
This (D)IPA floats like a mist through your mouth, whispering in every delicate flower's ear. This brew bites initially like a Doberman but pulls back and leaves you with a Maltese. This beverage has a sweet overtone which is quite uncommon in most American IPA's. Strong, yet subtle, the smooth ale finishes without the kick you would come to expect from the style. However, extra points have to be awarded for the individuality of this brew. This 90 IBU, 10% ABV, bottle conditioned brew could be transitional to some but not to Mr. Bud Light. This Pennsylvanian brewery has batted 1.000 with us and keeps us excited to try more.